This isn't about a pay raise - it is about Oklahoma's future. The Oklahoma teacher walkout planned April 2 has sparked controversy across the state. Oklahoma teachers have vowed to walkout of their schools if the Oklahoma Legislature doesn't take acceptable actions by March 28. This walkout isn't solely about the improvement of teacher pay, it is also in an effort to be able to pay for more support staff and an overall increase in the funding of education. Oklahoma ranks 49th in teacher pay, and ranks 47th in per pupil spending. In Blanchard, Oklahoma, teachers and administration for Bridge Creek Public Schools are prepared to walkout on April 2. Bridge Creek's middle school principal Kenny Ward said that lack of action by the Oklahoma Legislature over the years has swayed him to support the upcoming teacher walkout. "I have spoken against a teacher walkout for years," Ward said. "I felt it would only make the issue worse and lower the respect of the profession. As years have past with no action to remedy teacher pay in Oklahoma as well as school funding in general, it has become a desperate situation." Since 2008, education funding in Oklahoma has been cut approximately 28 percent. This means that over the last decade state general funding is down nearly $130 million while K-12 enrollment has grown by more than 50 thousand students. Jenny Goldsmith, a middle school teacher for Bridge Creek, said that her class sizes have notably increased. "We have grown by leaps and bounds the last few years," said Goldsmith. "My 7th hour class currently sits at 31 kids. Try dissecting and carrying out experiments with those numbers." The overwhelming class sizes are directly correlated with the lack of funding for public education. Lack of funding means lack of resources. Goldsmith has had to receive donations in order to dissect in her classroom along with being able to afford numerous supplies like gloves, aprons and cleaning supplies. Oklahoma has nearly two thousand emergency certified teachers with 536 teacher vacancies still left open this year, and nearly 500 teacher positions eliminated since last year. Oklahoma colleges aren't graduating enough teachers to satisfy the need of Edmond schools alone. "We are in crisis mode," Ward said. "We are emergency certifying thousands of teachers just in an attempt to get warm bodies in classrooms." With new graduating teachers leaving the state for a starting salary of upwards $20 thousand more than they would make in Oklahoma, there is an ongoing struggle to attract qualified teachers to Oklahoma classrooms. Monica Stewart, a middle school teacher for Bridge Creek, has been a special education teacher for many years. When Stewart moved in 2016 from Texas to Oklahoma she took a $21 thousand pay cut. "Just think, in five years a Texas teacher will have made $100 thousand more than an Oklahoma teacher," Stewart said. "I have a masters degree and 20 years experience as a teacher, but I still make $10 thousand less than a first year teacher in Texas." A drastic salary change isn't the only consequence Stewart has encountered moving to Oklahoma. "My special ed case load has increased significantly," Stewart said. Stewart not only teaches her own direct instruction students, but she and only one other special ed teacher along with two paraprofessionals support sixth through eighth grade general education teachers in accommodating the various needs of students who receive special ed services. "I enjoy my job and love my students, but it's a challenging task," Stewart said. "I wish we had more support." When Oklahoma teachers walkout on April 2 due to lack of funding, it isn't just about their low salaries. It is about every Oklahoma student's future. Oklahoma teachers have kept quiet about their pay for over 10 years, but with the lack of funding in education affecting their students' futures teachers refuse to stay quiet. Oklahoma teachers and administrators are not walking out for money, but they are walking out for Oklahoma's future. "Getting current teachers more money is very much needed," said Ward. "The reality is, that is but a small part of why we must increase teacher pay and school funding in Oklahoma. It’s more about future years and the future of our kids." 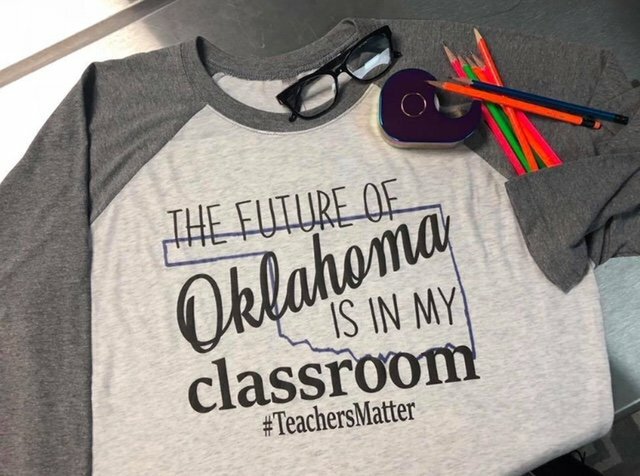 Bridge Creek educators will wear the T-shirt pictured above when they march at Oklahoma's Capitol on April 2.